Ar an 10/2 bhíomar mar scoil ar fad gníomhach ar feadh 10 nóiméid ag 10.00! 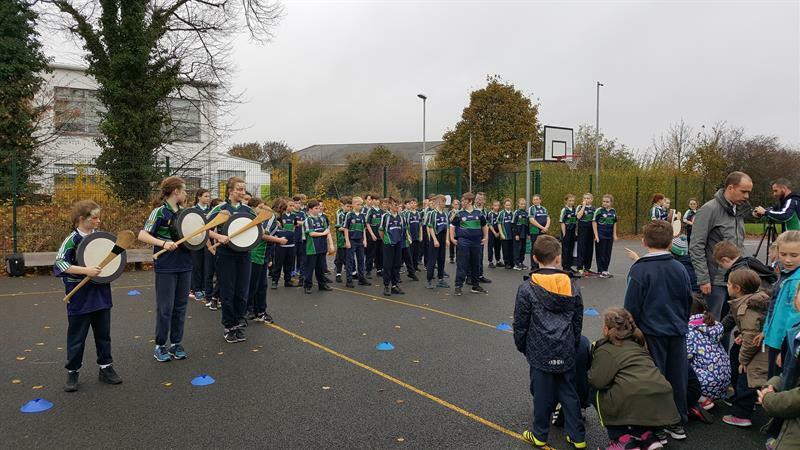 On the 10th of February as part of Operation Transformation Initiative, we as a school were all active at 10.00 for 10 minutes! 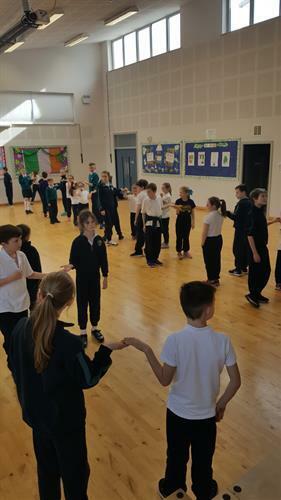 Tá ciseán cispheile i gclós Rang 5/6 anois! 5th and 6th class have a basketball net in their yard now! Spórt leis na múinteoirí le linn ár Seachtain Ghníomhach! Tá gach rang ag rith go laethúil! Bímid ag rith timpeall an clós le linn na seachtaine chun coiméad aclaí. Every class is running daily! We run around the school yard during the week to keep active! Na páistí in iomaíocht ag déanamh an "Plank"! Is breá le go leor ranganna www.gonoodle.com atá in úsáid don bhriseadh gafa sa rang! Lots of classes love the website above for keeping active in class! Check it out! Bhí seachtain Gníomhach GSER ar siúl ón 24 Aibreán! Bhí go leor imeachtaí ar siúl! Active School week ran from the 24th of April! T-Léinte GSER SEACHTAIN GNÍOMHACH!Buíochas le Alana agus Fiach ó Rang Dheirdre a rinne dearadh ar ár t-léine don Seachtain Ghníomhach! 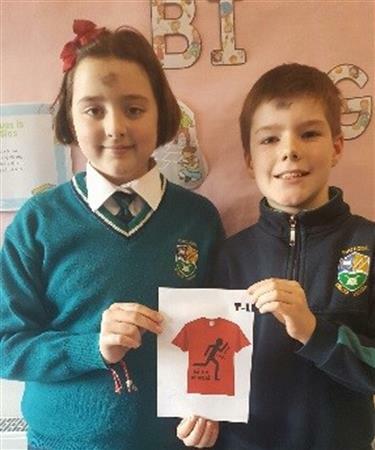 Many thanks to Alana and Fiach from rang Dheirdre who designed our t-shirt for active school week! Taisteal Gníomhach!Bhíomar ag spreagadh páistí le bheith gníomhach ag teacht ar scoil an seachtain seo- Bhí tuismitheoirí ag tabhairt amach greamathóirí do dhaoine a shiúl ar scoil! Active travel to school was encouraged during this week – parents were out giving stickers to those who walked to school GRMA! Obair bhaile gníomhach! 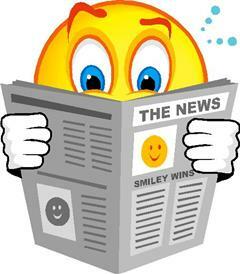 There was Active Homework every night for the week! Míle buíochas Pat as ucht ciorcaid a dhéanamh leis na hard ranganna i rith na seachtaine! 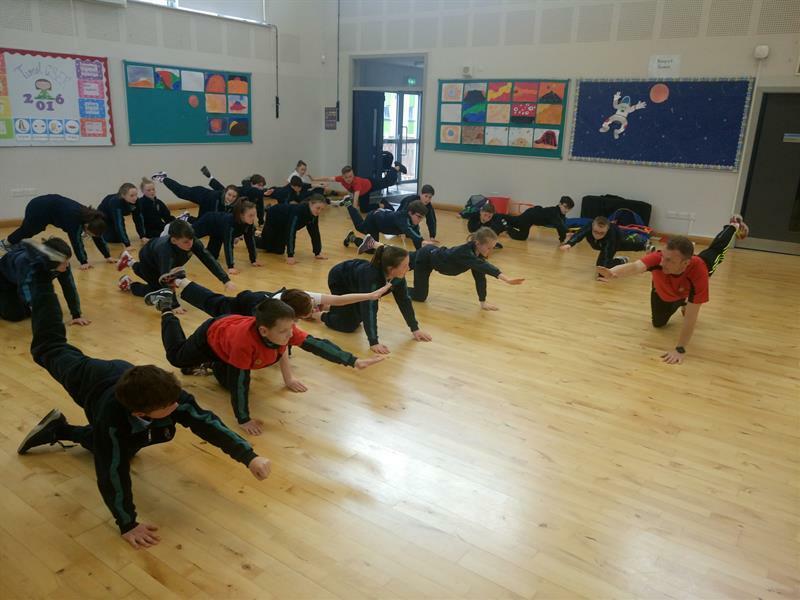 Many thanks to Pat O Dwyer who ran circuits with senior classes during the week! 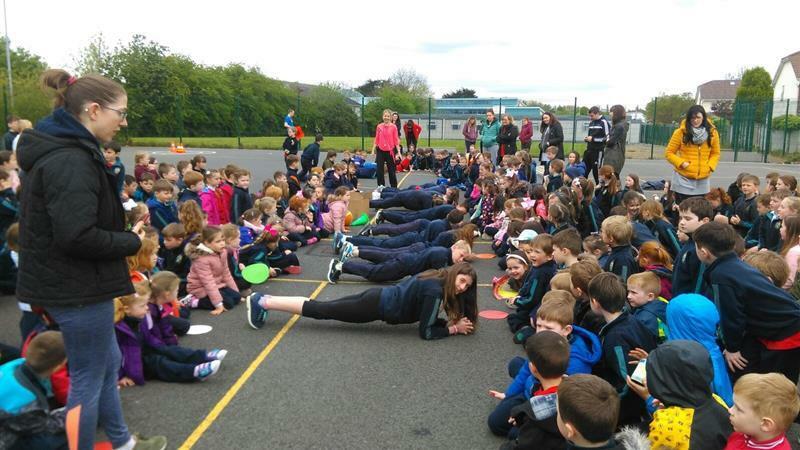 Tá briseadh Gafa sna ranganna – GoNoodle, Busybreaks agus Fit4skools. Every class have active breaks in class using GoNoodle, Busy breaks and Fit3skool. Supertroopers -tá ag éirí go maith leis! Supertroopers are going great! 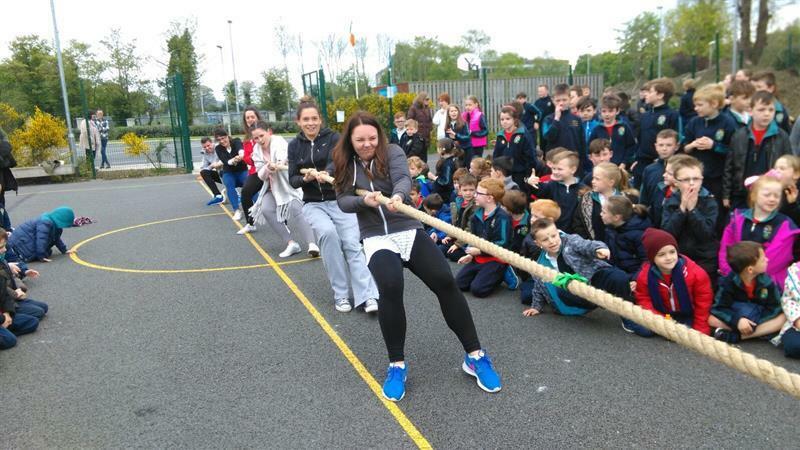 Bhí Ceardlann scipeála againn le Marc ó Skip in Rope i rith mí na Nollaig! Bhí am iontach againn! Bímid ag scipéail le linn am lóin inár gcúinne scipeála sa chlós! 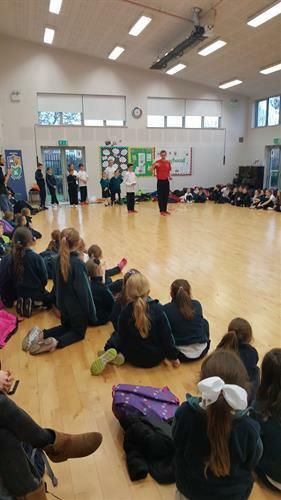 Skipping workshops took place with Marc from Skip n Rope during December and we had great fun! We love our skipping corner in the yard!